Are These the 14 SuperFoods? 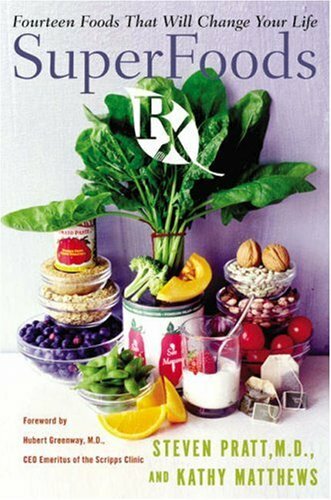 I just finished reading an outstanding nutrition book on what are considered the best foods you can eat. Back in college I read a lot of nutrition books and built a diet framework with that information. Not surprisingly many of my staples have earned SuperFood status. Of the 14, I eat all but oranges and turkey. Why don’t I eat oranges? I’ll save that tale for another post. The food the author made the strongest case for is actually not even listed as a SuperFood. That food is the orange bell pepper. It is nutritionally far superior than oranges. He made a weak case for consuming soy. So weak in fact, I will probably reduce my intake as it is estrogenic. Judging from the photo of the good doctor on the back cover, he can probably run a fast 10K, but I doubt he could bench press his weight. Despite the weak case for soy, the book is an excellent reference. I took notes and carried them with me to the grocery store yesterday. I read this one a short while back as well. Pretty dry stuff I thought but still informative and solid. I eat all of this stuff regularly except for the salmon which I dislike. Pumpkin is hard to eat except as a pie…made a pumpkin smoothie and it wasn’t bad…like drinking pumpkin pudding through a straw. Trader Joe’s sells awesome dried wild blueberries that are great in your daily cereal, fyi. The author lists carrots, sweet potatoes and orange bell peppers as alternatives to pumpkin. Those are probably more practical foods than pumpkin. Where does dark chocolate covered almonds fit into this list?